Renewed 8.26 m long cores ready to be delivered back to paper mill’s core stock. The Oulu Mill is one of the world’s largest and most modern facilities, manufacturing art-quality, coated, wood-free paper and board. The core recycling service was implemented in June 2006. 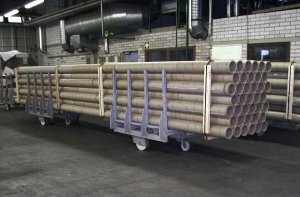 The diameter of the recycled cores is 150 mm and the length of released cores is 2.3 meters. Renewed cores are 8.26 meters long. Core recycling service is operated by Oplax Oy, located within the mill area.